Note: It is very important to understand the terminology of any subject you wish to have a working knowledge of. We have listed specialty words and their definitions below and we have included drawings to illustrate many of the terms. Batten: Also referred to as Purlins, see Purlin or Purloin. Batten or Purlins can be 1″x2″x4′ wood strips nailed to the roof or rafters, upon which the roofing is attached. In some instances they are also steel lengths measuring about an inch or so wide that have an elevated middle where one screws the metal roofing into. Sometimes called “hat channel” because of its shape. Battens or purlins are attached to roof decking to give a secure base to anchor the roofing materials to because many OSB (chip board sheets appearing much like plywood) will not hold a screws properly. Class “A”: The highest fire-resistance rating for roofing. Indicates roofing is able to withstand severe exposure to fire originating from sources outside the building. Collar/Boot: Pre-formed flange placed over a vent pipe to seal the roof around the vent pipe opening. Also called a pipe boot. Drip edge: A non-corrosive, non-staining material used along the eaves and rakes to allow water run-off to drip clear of underlying construction. Some eave trims have a built in drip edge. Trim that goes here is called “drip trim”. Trim that goes on these areas is referred to as “eave trim”,”eave flashing” or sometimes “drip edge”. (We use the term “eave trim”). Flashing: Pieces of special trim used to prevent seepage of water into a building around any intersection or projection in a roof such as vent pipes, chimneys, adjoining walls, dormers and valleys. Plumbing vent flashing (see collar/boot): Plumbing vent flashing prevents rainwater from running into holes cut for pipes in the roof. This flashing is sold according to the size of the vent pipe and the roof angle. Roofing material is installed over the flashing. Valley flashing: This flashing is used in open valleys of the roof. Most often leaks are found in the valley flashings due to flashing that is nailed to tightly to the decking or panels that are not trimmed far enough off the flashing. Flashing cement: In the application of metal roofing, flashing cement is usually a clear silicone caulk (purchase the best grade available). This is used to further seal any potential leaks, usually at areas wherein flashing was applied. A small bead of flashing cement where the flashing comes in contact with a vertical wall is a good idea. Trim that goes on this part of a roof is called “gable or rake trim”. We use the term “gable trim”. Hip roof: A type of roof containing sloping planes of the same pitch on each of four sides. This type of roof does not contain a gable(s). Ice dam: Ice dams occur when snow melts near the ridge lines of warm roofs (roofs without adequate ventilation). As the water runs down the roof to the overhang, it cools and freezes. If the snow continues this melt and freeze process, an ice dam can form that can seep under the shingles, through the decking and into the house. This, of course, can cause serious roof leaks–even in freezing temperatures. Low slope application: Method of installing roofing material on roof slopes between one and two inches per foot. 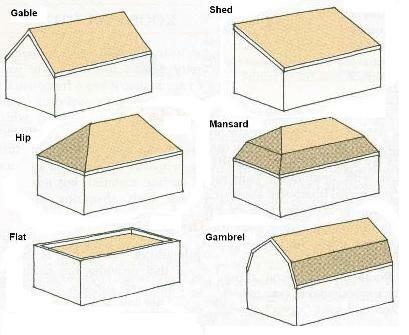 Mansard roof: A type of roof containing two sloping planes of different pitch on each of four sides. The lower plane has a much steeper pitch than the upper, often approaching vertical. This type of roof contains no gables. Metal drip edge: This refers to trim, usually gable and eave trim, that has a slight bend at the edge which facilitates water runoff, away from the building. 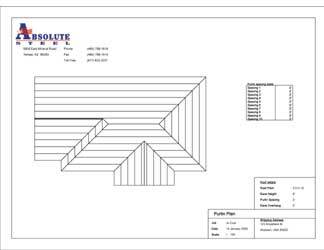 All our eave and gable trims contain this feature. 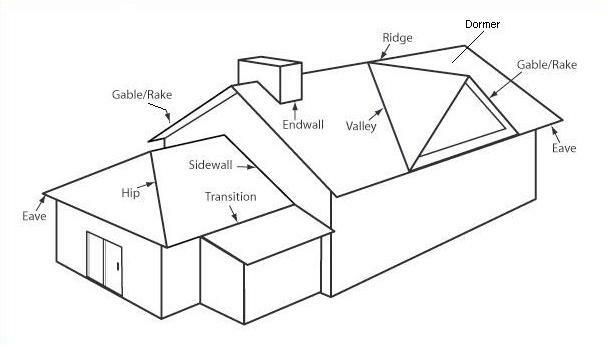 Open valley: Method of roofing in which the roofing material on both sides of the valley is trimmed along a chalk line snapped on each side of the valley, leaving the valley flashing exposed. Metal roofing always has this feature . Pitch: Also known as “slope”, pitch is the measure of how “steep” a roof is. For example, if a roof is a 4/12 pitch, the roof rises 4 inches for every horizontal run of 12 inches. The pitch of the roof is a big factor in determining the kinds of materials that can be used and the longevity of the roof. Usually, a steeper roof (higher pitch) will last longer due to its better drainage capabilities. Purlin: Horizontal lengths of material (wood or metal) that are affixed to the roof and to which the finished roofing material is affixed. Purlins can be wood strips (1” x 2”) or can metal and are usually a 1” subgirt material preferably galvanized steel. Because the purlins elevate the new roof slightly they also contribute to your new roofing having airflow which can help dispurse temperatures in the heat of the day. It’s sometimes necessary to use purlins over an old roof as the purlins give one the ability to do some “leveling” by using feathering strips or shims between the purlins and the irregularities of the old roof surface. Rafter: The supporting framing member immediately beneath the deck, sloping from the ridge to the eave. Rake: The inclined edge of a sloped roof over a wall from the eave to the ridge. These two slopes meet at the peak or ridge. Trim that goes on these slopes is referred to as “gable or rake trim”. We typically use the term “gable trim”. Trim that covers this area is called “ridge cap”. Sheathing: See Batten. Exterior grade boards used as a roof deck material. “Step sheathing” is used alone or in combinations with solid sheathing for installation of tiles or shakes. Step sheathing allows air circulations under the tiles by using 1-by-6 or 2-by-6 boards that are evenly spaced so that air can move under the tiles or shakes. Slope: The degree of roof incline expressed as the ratio of the rise, in inches, to the run, in feet. Also referred to as “pitch”. Slope Applications: Divided into three categories, this is the application of roofing materials to a roof based upon its slope or pitch. The three categories are known as “steep slope application, “normal slope application” or “low slope application”. Steep slope application: Method of installing roofing material on roof slopes greater than 21 inches per foot. Normal slope application: Method of installing roofing materials on roof slopes between 4 inches and 21 inches per foot. Low slope application: Method of installing roofing materials on roof slopes between two and four inches per foot. Underlayment: We recommend synthetic roofing underlayment. It is made from a woven black polypropylene with polymer. It is UV resistant, the membrane is self-sealing where nails have penetrated it for attachment purposes and it is slip resistant. Synthetic underlayment is vastly superior to the old felt paper and is recommended for use under metal roofing. Valley: The internal angle formed by the intersection of two sloping roof planes to provide water runoff. Trim that goes on this area is called “valley trim”.